I think I really messed up; last night the temperature dropped to minus-5 degrees. I thought about the fresh water and left it dripping at a faucet, but I never thought about the holding tanks. They were left closed and by the time I thought about it at 2:00 am, it was too late. What is the best way to get them thawed out? The temperature is supposed to stay below freezing for a couple of days. Thanks! John R.
John, if your holding tanks are not in a heated compartment, but protected by a sub-floor or an enclosure on the bottom of the coach, a drop light with a 100-watt bulb placed within the same void will eventually thaw the contents of the tanks, albeit somewhat slowly. 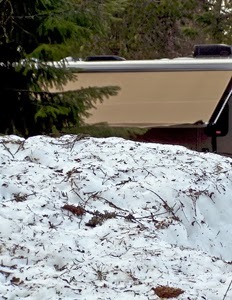 If the tanks are exposed underneath the RV, a common hair dryer, or better yet a heat gun, can be used to gradually thaw the tanks. But be extremely careful to not allow the gun to stay focused on one portion of the tank for very long; it can easily melt the plastic container. Slowly moving the heat gun over the bottom of the tanks in a slow arc will eventually de-ice them. It may take a while, depending on how large the tanks are, but it will eventually thaw. Be very sure the tanks are completely thawed prior to operating the waste valves for evacuation. It’s okay to also use the heat gun on the valves themselves, just don’t linger too long in one spot. In the future, you can always add windshield washer fluid (if permissible in the sewer system in your area) or RV anti-freeze to each tank to keep them from freezing. The fuller the tanks, the less likely to freeze. Just keep adding a half-gallon of anti-freeze each day the temps remain below freezing.